Are pigs scary? Sure, why not? 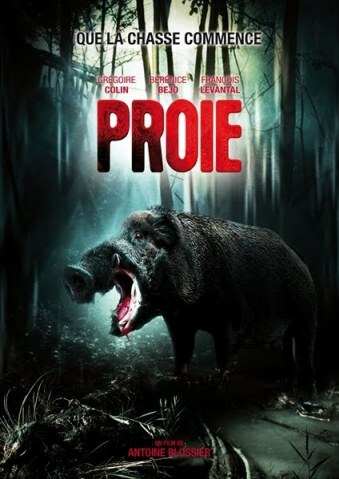 In the French thriller Prey, some really vicious swine bedevil a wealthy family of corrupt industrialists. Much mayhem ensues. Nutshell: The aforementioned 1 percenters gather at the family mansion for various reasons: the family business (pesticides, natch) is in trouble, and the youngest daughter is considering marriage and a move away with her fiancee (Grégoire Colin). Before anyone can make any sort of decision, a herd of deer commit suicide by throwing themselves on an electric fence. The menfolk get their shooting irons together and investigate. Enter monstrous, mutated killer pigs. Prey (Proie en Francais) is a righteous little movie and proof positive that pigs—yes, pigs—are a formidable foe with much potential to plague mankind. All hail the coming of Swinecore!